What Happens When I’m Willing to Release Control? 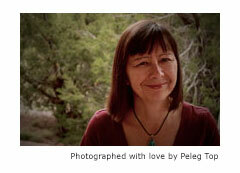 When I first moved back to New Mexico two and a half years ago, I created a wonderful, ever-changing art project for myself. 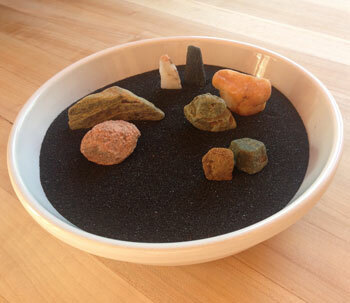 I filled a white, ceramic, shallow, baking bowl with fine black sand and created a new Zen “rock garden” daily, or as inspired. On my daily walks, I would notice which small rocks wanted to come home with me to play in the rock garden. I loved collecting various sizes, shapes, colors and textures. The interplay between matte finishes and shimmery finishes delighted me. I put all possible rock players in a basket in a drawer beneath my butcher block counter top. Whenever I felt like it, usually while waiting for my coffee to brew, I would take the current rocks out of the garden and arrange new ones. Sometimes the basket got too full to close the draw and then some of the rocks would go back outside. 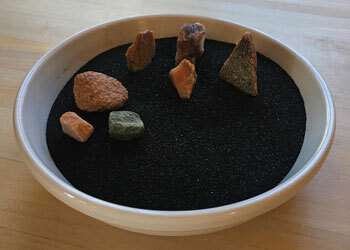 I loved the ever-changing parade of rocks in the consistent, stable environment of the white bowl with the black sand. 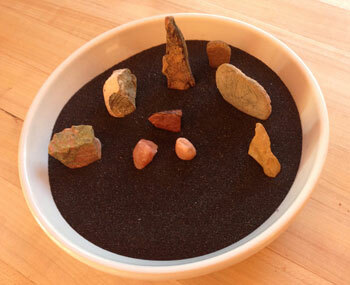 One of the best parts of the ritual involved picking my “favorite” rocks to play with on any particular day. After a few months, the same rock garden would stay in place for weeks or months. One day last summer, the wind kicked up through the open widow behind the rock garden and, in a moment, black sand was all over the kitchen. After I had cleaned up everything, I put the bowl and what was left of the sand into a cupboard. Fast forward to a couple of weeks ago, when I felt inspired to put the rock garden back in service. Once again, I was enjoying the ever-changing art. Then, spontaneously, a few days ago, I decided to change it up. I had pulled the rocks out of the sand and was beginning to choose the next rocks to play. For fun, I’ve included photos of three different rock gardens. Which one of them do you think has the “random” rocks rather than the “chosen” rocks? So what about you? What might be the value for you in releasing control in a particular area of your life right now?